Oscilloscopes are my favorite instruments to use. They offer such a tremendous amount of information for just one connection. 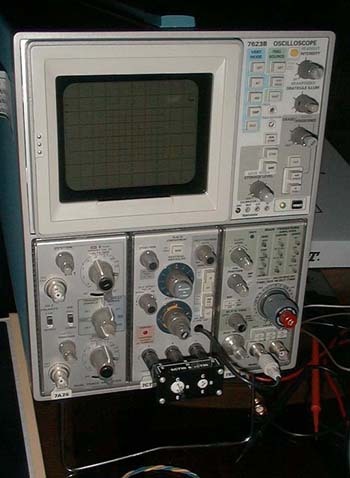 If the voltage you want to look at is dynamic... then an oscilloscope is the instrument for you. This page is under development... it will have photos and descriptions of my various new and BoatAnchor 'scopes-which I hope you will enjoy. The Fluke Scopemeter-series of solid state oscilloscopes is my idea of the best combination of features and performance available in a portable 'scope. I would never have been able to afford a new one-except that a fellow in Nevada had decided not to go into the electronics repair business after all. He had this one still in the box after a year or two, and decided to sell it for essentially one half price. It is such a terrific instrument, doing everything I need from a portable instrument, and more.